Despite the turmoil surrounding the final months of his life, Joe Paterno is one of the most beloved figures in sports history. Not surprisingly, Joe Paterno memorabilia has long been in high demand. He led the Penn State Nittany Lions for 46 years, taking them to National Championships in 1982 and 1986. JoePa's list of accolades include 24 Bowl wins and 409 career victories, making him the wins leader in NCAA Division I history. Paterno was inducted into the College Football Hall of Fame in 2007. Shop for Joe Paterno memorabilia on Amazon.com. Despite his accomplishments, Paterno found himself in the middle of a major scandal when one of his assistants, Jerry Sandusky, was charged with sexually abusing children. Amidst accusations that many in the school knew about the issue but didn't do enough to stop it, Paterno was fired by Penn State in late-2011. 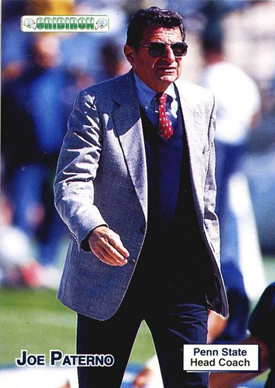 Diagnosed with lung cancer just weeks after being let go, Paterno passed away in January, 2012 at the age of 85. Few sports figures had the respect and following that Paterno had. Combine that with the somewhat limited collectible options from having a career at the college ranks and it's easy to understand why Joe Paterno memorabilia commands such attention. Autographed Joe Paterno memorabilia is the most popular with signed photos leading the way. 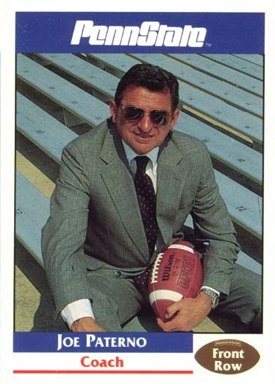 Other popular pieces of Joe Paterno memorabilia include issues of Sports Illustrated, programs and assorted novelties. 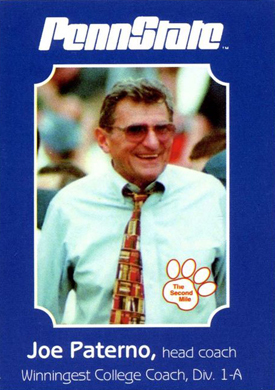 In 2004, Paterno was honored on a beautiful Wheaties box. Persistent collectors may want to go after tickets from milestone games and Bowl matches. 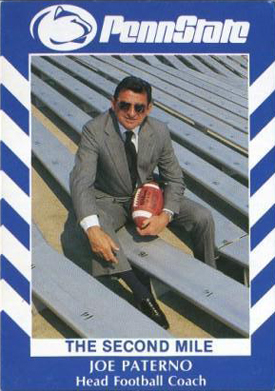 Because his success came from the college ranks, few Joe Paterno card options exist. His rookie hails from 1950 Topps Felt Backs, which is regarded as the first all-football set produced by the company. The miniature 7/8" x 1 7/16" cloth cards were inserted with Varsity Gum. Paterno is pictured as a player with Brown University. The front features a black and white portrait on a plain blue backdrop. The back has an image of a Brown pennant. 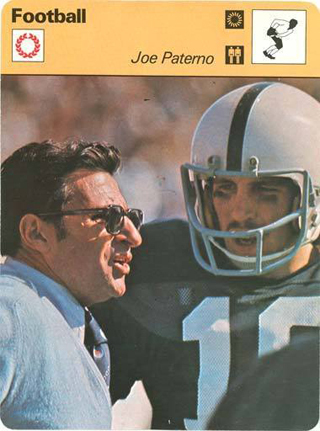 Extremely difficult to find, let alone in good condition, collectors should expect to pay several thousand dollars for the first Joe Paterno card. 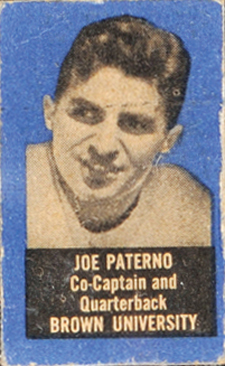 Most other Joe Paterno cards were released in connection with the school. 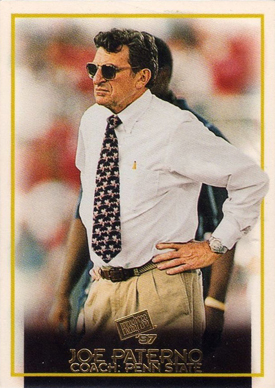 The 1997 Press Pass Joe Paterno card, one of his few pack-inserted cards, commands very high prices, in part due to it being a short print. The closest thing card collectors can get to autographs are a pair of extremely rare cut signatures. One, in 2009 Donuruss Classics, had just three copies, while a 2010 Sport Kings Paterno cut signature card was a one-of-one. 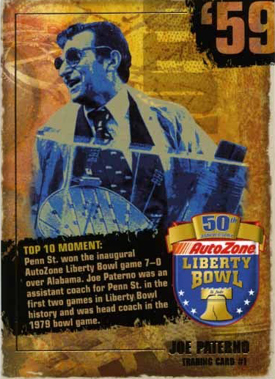 Topps announced they were going to have a JoePa autograph in 2008 Topps Mayo, even releasing pictures of a mock-up. However, the card never materialized. Below you will find an example of what Joe Paterno's authentic signature looks like. This can be used as a first point of reference for determining the legitimacy of autograph memorabilia, but is not a substitute for having your items authenticated by a well-respected professional autograph authentication company. I have a rare 2011 outback 25 annv. full size football signed by Joe Paterno and urban Meyer. I would like to sell it but don’t know how to go about it. Where to go and do it or what it is worth. Can you help. Lou Compostella � Nice piece! Your best bet would be to get it authenticated by PSA/DNA or JSA first then list it on eBay. Even if you know it’s real, third-party authentication will make potential buyers feel confident in your piece. I received a signed dollar with Joe paternos autograph. Would that be worth anything?